I met my first Sea of Cortez pearl in a tiny boutique, now long gone; the jeweler Beni Sung displayed every kind of pearl, each held high on top of a long pin, like a Victorian hat pin, with a little cup on top. Amid nacreous beauties, it stood out, glowing and shimmering like Charlize Theron in a hammered-satin evening dress: seriously beautiful. In a bay near Sonora, Mexico, the producer "Perlas del Mar de Cortez" farms two species of oyster which yield a small harvest, about 4,000 pearls per year. 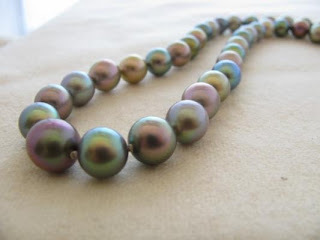 These pearls display a unique dispersal of aragonite crystals, the component of nacre, which results in opalescent, shimmery pearls; the very best have a breathy, shifting rainbow play of colour. And you would go for that, even if it means one pearl instead of a strand. One extraordinary gem made by nature, in the sea. They exist in white, but also black, grey, purple, lavender and blue. Perfect rounds are rare, but you can find baroques, and semi-baroques (ovals, drops and buttons) which look more interesting anyway. They are never treated and have very good nacre thickness, so they will last lifetimes if treated well. Cortez pearls are usually not found in sizes above 10mm but have so much presence that an 8mm commands a head-swivel. The Mexican beds were almost hunted to extinction for both the pearls and shells; in 1939 a permanent fishing ban was imposed and careful culturing returned production to the beds in Sonora, but it took till the mid-'90s to revive the pearls to a level where they can be sold. Enough pearl nerdiness; let's see some! eBay seller Carolyn Ehret of Ehret Design Gallery is a reputable source for pearls. 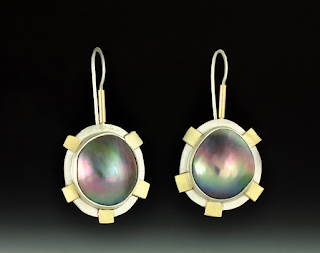 Here's one example from a recent listing, a big (10.6mm x 13mm) Sea of Cortez rainbow baroque pearl with a smaller Sea of Cortez keshi, set as a pendant. Set with 20k accent bead and head pin. BIN price was $350. The pearl will flash teal, green, purple, pink, all natural. Sarah Canizzarro at Kojima Company is an avid pearl-hunter, and sometimes offers these gems, usually as a ring or loose pearl. 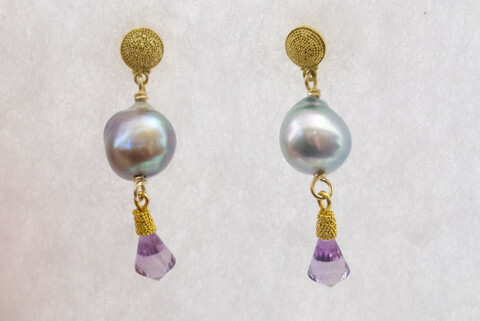 She recently listed one shimmery 10mm pair of earrings, with amethyst drops echoing the lavender shimmer of the pearls; price, $1,100. 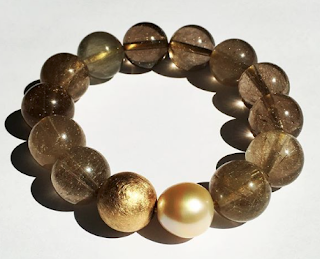 Cortez pearls of the mabé variety (a half or blister pearl with a filled back) are a way to flash that fabulousity without hitting three figures. Necklaces? Owned by people who don't want their names published. 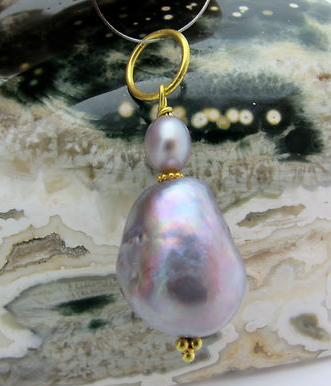 But if you would like a pendant, contact Kojima Company, because Sarah can graciously hunt the perfect pearl for you, and has excellent contacts for such rarities. These are really gorgeous, and not demure in the least. I do like that pendant! I love the colours of the earrings. Wow, these are stunning. Thanks for this very informative post! 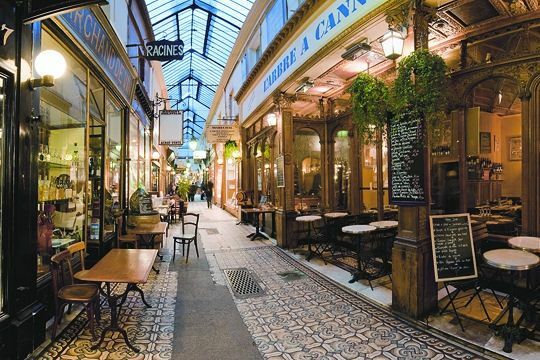 Louise took the words right out of my breathless mouth: stunning! Looks like I need to do some creative planning for a special gift. You should have been a pearl broker. I want you to know that I really enjoy your blog. I suspect is has much to do with our common love for pearls. And yes, these are lovely. 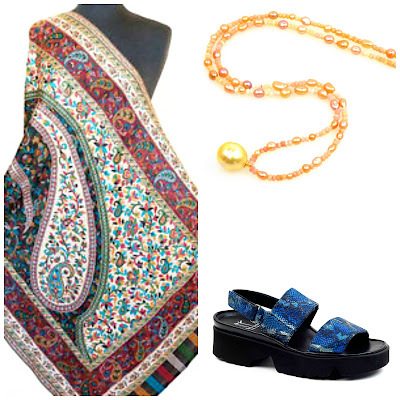 I used to have a boutique for women - comfortable, natural fiber clothing, accessories and silver jewelry. However, when I went to market in NYC there was this wonderful Chinese gentleman who sold fine jewelry, especially pearls to the market customers for the customers own pleasure. Needless to say he was a great bargain. I miss him today. Gretchen: In a low-key way, I am, informally. Sometimes readers or friends write with requests or questions. Liz: What a wonderful resource, and thank you for rminding us that when we find special vendors, they may not be around forever.